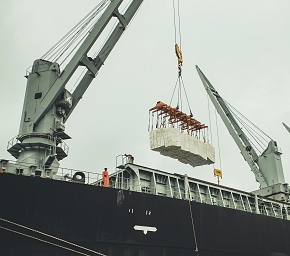 Conlog is responsible for unloading pulp from trains, transporting it to warehouses, inventory management, internal warehouse movements, placement alongside ship and loading. April 11, 2018 - In March, Conlog (Concórdia Logística) started port operations at Terminal 32 (T32) located in the Macuco area of the Port of Santos in the state of São Paulo, Brazil. Handling primarily pulp, paper and general cargo, T32 was leased by Brazilian market pulp producer Fibria. The term of Fibria's concession contract for the area is 25 years. Conlog also is responsible for Fibria's port operations at Terminals 13, 14 and 15 in the Outeirinhos area. “The fact that we have been working for Fibria for three years at the Port of Santos and that this new operation expands the scope of our activities confirms our high performance in terms of both productivity and safety initiatives,” said André Stern, Commercial Director of Conlog. The area of Terminal 32 has a 33,400-sq.meter warehouse with the capacity to store 40,000 tons of pulp and total annual pulp shipping capacity of 1.8 million tons. The terminal is part of the logistics solution for transporting production from Fibria's second pulp mill in Três Lagoas, Mato Grosso do Sul, which started operations in August 2017. “The startup of Terminal 32 strengthens Fibria's strategy and competitive advantage in logistics integrated with the forestry and industrial areas, since we export over 90% of our production,” said Wellington Giacomin, Director of Logistics, Supply and IT at Fibria. Fibria's logistics structure includes the Intermodal Terminal in Aparecida do Taboado, Mato Grosso do Sul, from where the output of the Três Lagoas pulp mill is shipped directly to the Port of Santos. Fibria's new pulp production line at Três Lagoas has an annual production capacity of 1.95 million tons of eucalyptus pulp. Combined with the mill's existing production unit, Três Lagoas has a total production capacity of 3.25 million tons per year. Considering all of its units, Fibria's annual pulp production capacity amounts to 7.25 million tons.